CCHS Conference 2018 - Avery Biomedical Devices, Inc. 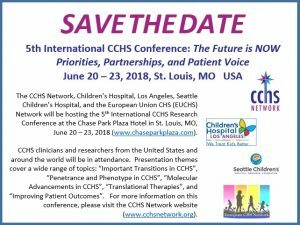 The CCHS Network, Children’s Hospital, Los Angeles, Seattle Children’s Hospital, and the European Union CHS (EUCHS) Network will be hosting the 5th International CCHS Research Conference at the Chase Park Plaza Hotel in St. Louis, MO, June 20 – 23, 2018 (www.chaseparkplaza.com). CCHS clinicians and researchers from the United States and around the world will be in attendance. Presentation themes cover a wide range of topics: “Important Transitions in CCHS”, “Penetrance and Phenotype in CCHS”, “Molecular Advancements in CCHS”, “Translational Therapies”, and “Improving Patient Outcomes”. For more information on this conference please visit the CCHS Network website (www.cchsnetwork.org).